Can I single handedly undo all of the healthy things I accomplished with the Quinoa and Black Bean Tacos? Challenge accepted. (I know, it’s like I have split food personalities sometimes.) 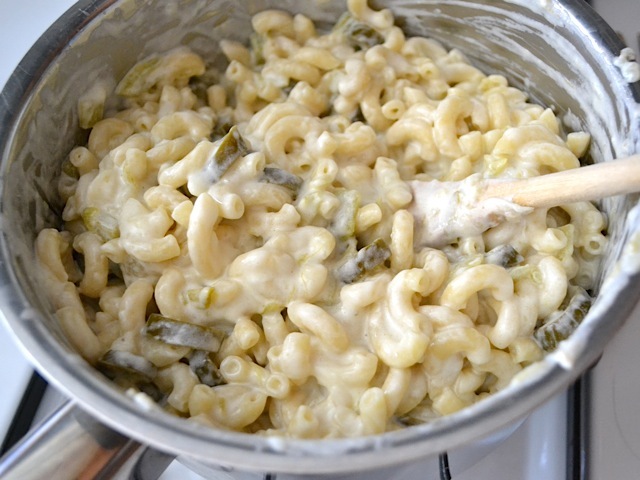 But how can you say no to something like Jalapeño Popper Mac & Cheese?? Once that’s in your head the only way to get it out is to actually make it. 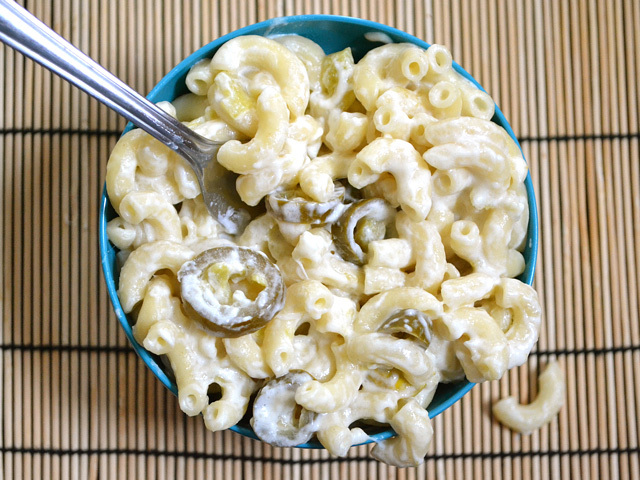 This Jalapeño Popper Mac & Cheese is a super ooey-gooey white cheese mac with spicy jalapeños and zesty green chiles. 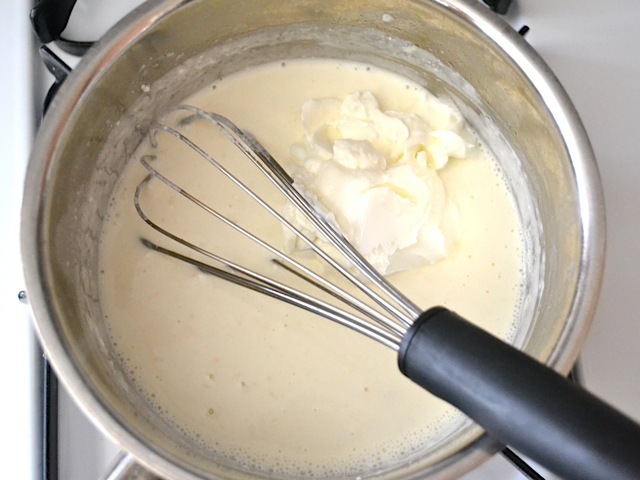 It whips up really fast and doesn’t require a roux based cheese sauce, which can be tricky for new cooks (or just those new to cheese sauces). It’s super rich, so I estimated a serving to be just a cup. That’s all I needed before the cheese sensors in my brain quieted down and drifted into a satiated slumber. You could make it more “popper” like by topping it with some buttered bread crumbs and baking it in the oven, but I’m a little impatient when it comes to mac and cheese and don’t have time to wait around for things to bake, so I left it well enough alone. I also contemplated topping it with bits of crisp bacon, but again that would have delayed my enjoyment of this creamy delight. But those are both tasty options if you’ve got time to spare. 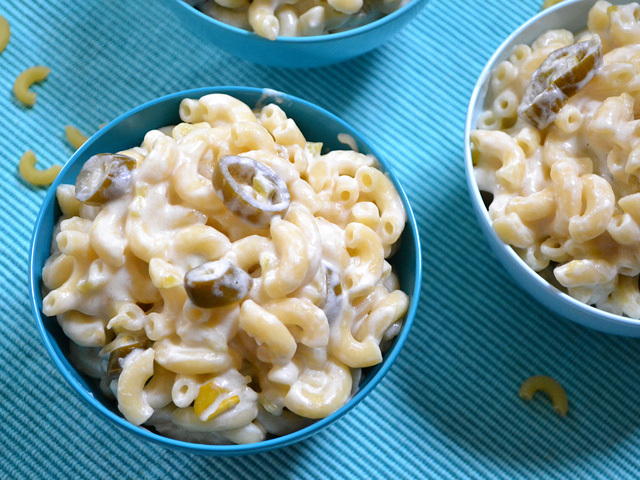 This quick Jalapeño Popper Mac & Cheese is the fastest way to feed your spicy macaroni and cheese cravings! It's ultra creamy, with just the right amount of spicy kick! Bring a large pot of water to a rolling boil and then add the pasta. Let it continue to boil until it is soft (about 10 minutes). While the pasta is cooking, prepare the sauce. 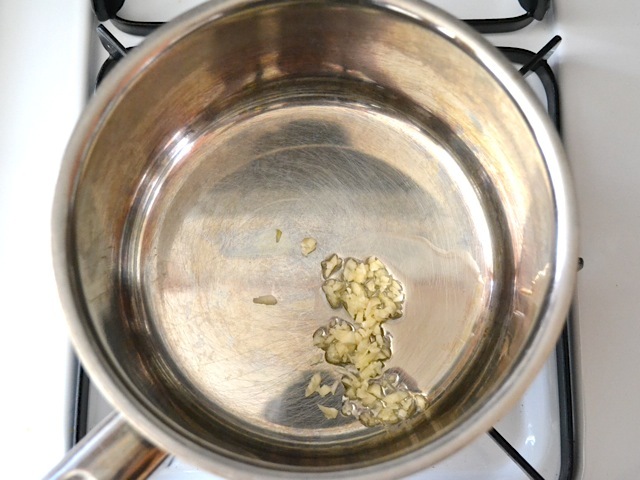 In a medium sauce pot, cook the garlic in vegetable oil for about 1-2 minutes or just until soft and fragrant. 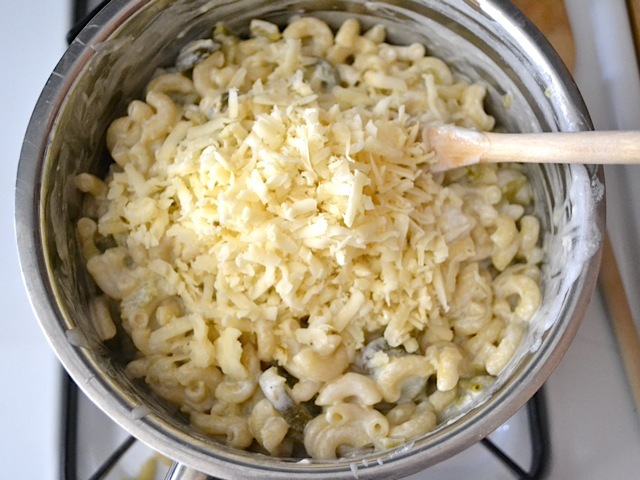 Add the milk, cream cheese, and grated parmesan. 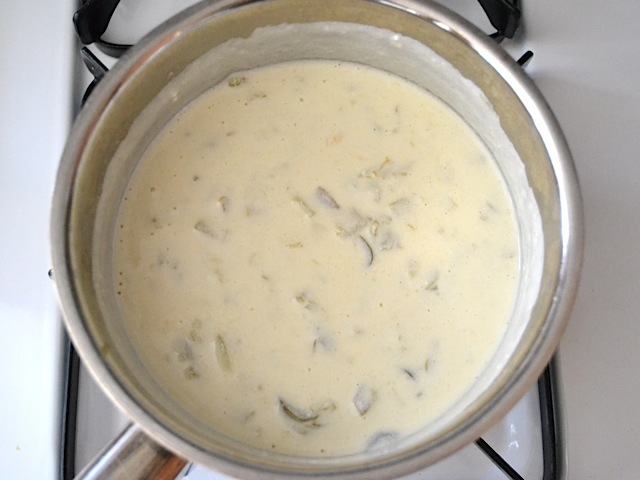 Continue to stir and cook over medium heat until the cream cheese is warm and softened. Use a whisk to stir the ingredients together until smooth. Turn the heat down to low and then whisk in the sour cream. Drain the jalapenos and green chiles and then stir into the sauce. Taste the sauce and add 1/4 tsp of salt if needed. When the pasta is finished cooking, drain it in a colander. Return the drained pasta to the pot (heat turned off), pour the sauce over top, and stir until well mixed. Sprinkle the shredded pepper jack over top and then stir in. The heat from the sauce and noodles should be enough to melt the cheese. Serve hot! First get your pasta cooking (I forgot to take a picture of that), then begin the sauce. Saute a clove of minced garlic in vegetable oil over medium heat for about 1-2 minutes or just until it softens a bit. Then add the milk, cream cheese, and parmesan. 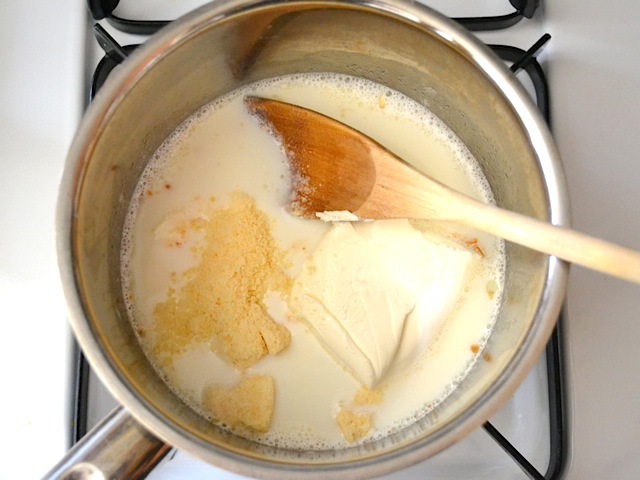 Stir and cook this mixture over medium heat until the cream cheese is warm and softened enough to whisk into the milk. Whisk until the mixture is smooth. Then turn the heat down to low and whisk in the sour cream. Drain the liquid from the jalapenos and chiles (my chiles didn’t really have any excess moistures, but if they do, go ahead and drain them). Stir the jalapenos and chiles in the sauce. Then it will look like this. Give it a taste and add a little (1/4 tsp) of salt if needed. 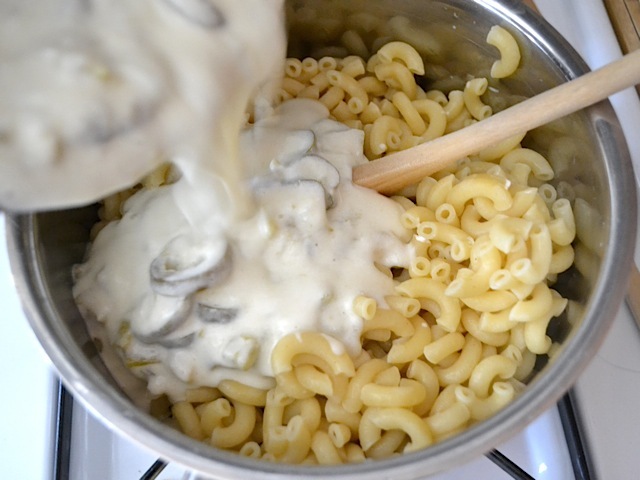 When the pasta is finished cooking, drain it in a colander and then return it to the pot with the heat turned off. Pour the sauce on top and stir until combined. Lastly, add the shredded pepper jack and stir it in until the heat from the pasta and sauce melts it. And then it’s as ooey and gooey as it gets! Enjoy (but not too much)! Revisiting this post in 2018, woot woot! Do you think this recipe would freeze well? I have made before, but not froze it. Thanks! I made this a few nights ago and it was fantastic! We are currently living in the UK so we had to fudge some of the ingredients, but it turned out fantastic. 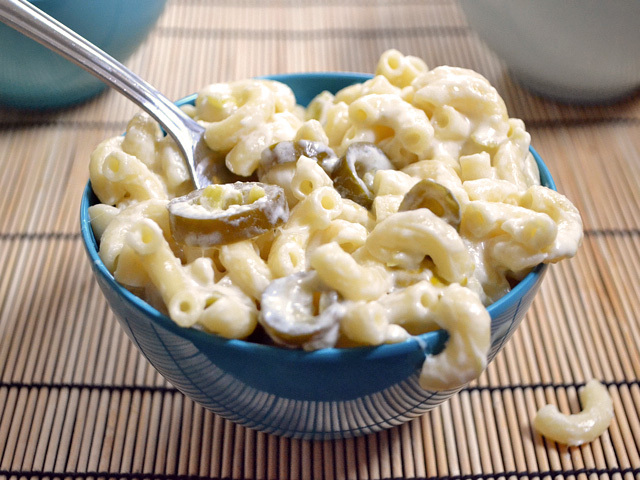 (We couldn’t find tinned chillies so we added more jalapenos instead, used pickled jalapenos instead of tinned, subbed mature cheddar for pepperjack cheese, and added some green onions.) It was exactly what we hoped it would be and we will have to serve it when we have guests over some time soon! I just made this for myself and my fiancee, she’s allergic to Monterey Jack cheese so I subbed White Cheddar for her half. I will say it might be a good idea to change this recipe (and other multi-serving pasta recipes) to 1 LB instead of 12 oz, since most pasta comes boxes that size. I guesstimated the amounts and it turned out good, but I’m not sure if it was dead on your recipe or not since I didn’t realize until I’d already started cooking and had to adjust measurements quickly. How do you think this would fare using Spaghetti Squash in place of the elbow macaroni? This is a favorite, but the first batch I made was too spicy for my taste. I thought I had a high tolerance, but this totally knocked me off my spiciness pedestal. The next time I halved the peppers and chiles and that brought it to the perfect level for me. I’ve made this twice and absolutely LOVE it. I am going to make this for my gentleman friend soon, and I was thinking of slicing up some chicken breast to add a bit more protein and then baking it with these Italian bread crumbs I’ve had in my pantry for way too long. I’m a baby chef, though, so I’m not sure how long and at what temperature I should bake this at? I don’t want to burn or overlook anything. :( I am also browsing through your book right now looking for a good side dish option! Thanks again for publishing a wonderful book! Beth ! This was so delicious and probably the easiest quickest recipe I’ve ever made! I didn’t even have canned jalapeños so I just used green chilies and when you use fat free sour cream, skim milk, low fat cream cheese and reduced fat cheese its really not toooo unhealthy and was still so creamy and flavorful! I even had veggie cavatapi so there were secret healthy veggies in every bite, sooooooooooooo yum! Made the recipe exactly as posted and it was as fabulous as it looks. Served as a side dish with “Mexican” meatloaf and it rocked. Love your blog. Haven’t had a recipe yet turn out anything but awesome. Sorry to hear :( I guess spiciness is pretty subjective… and not really sure why yours may have ended up runny – mine was so thick! Hey Beth! I recently quit my day job, and sadly my food-experimenting budget had to be cut to cover medical insurance. Some friends recommended your blog as a place to find good, cheap and (sometimes) healthy recipes; I expect to be a frequent visitor. =) This recipe in particular was awesome! T. Joiner – It’s fairly spicy and you’re right, subbing the pepper jack will help quite a bit. You can use Monterrey Jack cheese instead, it’s the same thing as pepper jack, but without the peppers :) That way you’ll still get that nice, smooth meltiness! This sounds and looks awesome! How spicy is this recipe? 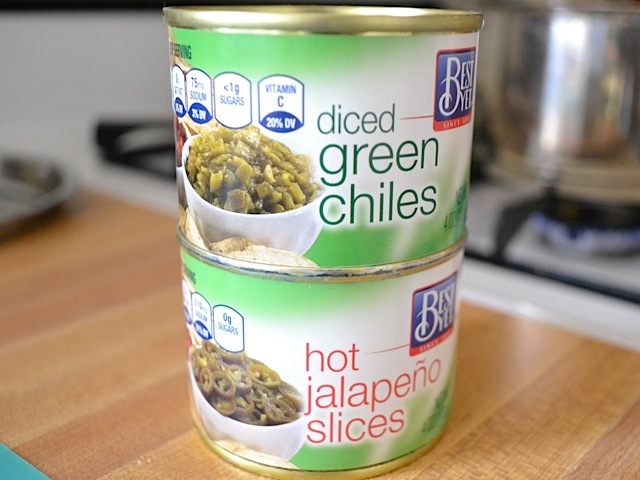 I don’t want it to be too spicy because my daughter and I don’t like a whole lot of spice (jalepenos are about as spicy as I can stand). Also, what would be a good substitute for the pepper jack cheese? If I use jalepenos, I’ll cut the pepper jack cheese.